In 2014, most Americanns are barred by law from visiting Cuba, the island nation closest to America. When it comes to Cuba, Amrica's vaunted ideals of "free trade" are frankly repudiated by the government in Washington which justifies violation of Americans' freedom to travel in the name of supporting democracy and human rights. 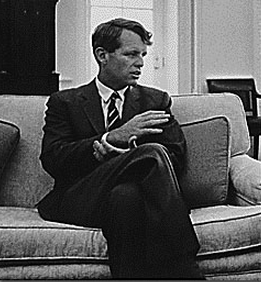 A half century ago, Attorney General Robert F. Kennedy came to believe that the ban on travel to Cuba was "inconsistent with "our views of a free society," as these historic documents collected by the non-profit National Security Archive reveal..
On December 12, 1963, less than a month after his brother's assassination in Dallas, RFK wrote a memo in which he argued that the travel ban imposed at the end of the Eisenhower administration was a violation of American freedoms and impractical in terms of law enforcement. Among his "principal arguments" for removing the restrictions on travel to Cuba was that freedom to travel "is more consistent with our views as a free society and would contrast with such things as the Berlin Wall and Communist controls on such travel." RFK's daughter Kennedy Townsend cited her father's views in a 2009 opinion piece in the Washington Post , that argued that President Obama should consider her father's position and support the Free Travel To Cuba Act that has been introduced in the U.S. Congress. Obama has not acted. Nor has Attorney General Eric Holder. According to Peter Kornbluh, who directs the Archive's Cuba Documentation Project, the documents "shed significant light on the genesis of the travel ban to Cuba, and the first internal debate over ending it." The original rationale for the ban "is no longer applicable," Kornbluh notes, "but RFK's arguments remain relevant to the current debate over the wisdom of restricting the freedom to travel."